Here are five names to have at your fingertips about the fourth World Cup, hosted by Brazil and won by Uruguay. Maracana. Brazil was a natural choice to host the World Cup after the tournament’s hiatus during World War II. Rebuilding European nations didn’t put soccer stadiums high on their priority list. Brazil, where soccer’s popularity exploded during the first part of the century, built the 200,000-seat Maracana Stadium in Rio de Janeiro. Construction was still underway as the teams arrived and not quite completed. Yugoslav midfielder Raijko Mitic suffered a forehead wound when he walked into a protruding metal beam on his way out of the locker room before a 2-0 loss to the host. The stadium is named after the nearby river. Recife. The city near the equator (where the USA would fall, 1-0, to Germany in its final group game of the 2014 World Cup) was where France was scheduled to play its second game. That the first game was to be played 2,000 miles away in Porto Alegre prompted the French to withdraw. Frenchmen Henri Delaunay and Jules Rimet, who kept the World Cup trophy under his bed during World War II, had been the key men behind the launch of the World Cup in 1930. Other absentees included Germany (suspended), Argentina (squabbles with Brazilian federation) and all Eastern European countries besides Yugoslavia. Joe Gaetjens. England, the birthplace of organized soccer, had finally joined FIFA and in its first World Cup fell victim in one of the biggest upsets in soccer history. It was defeated, 1-0, to part-time players from the USA. The hero was Haitian-born Joe Gaetjens, who was on break from studying at Columbia University and working as restaurant dishwasher in New York when he scored the famous goal. Losses to Spain and Chile kept the USA from advancing out of the first round. Alcides Ghiggia. 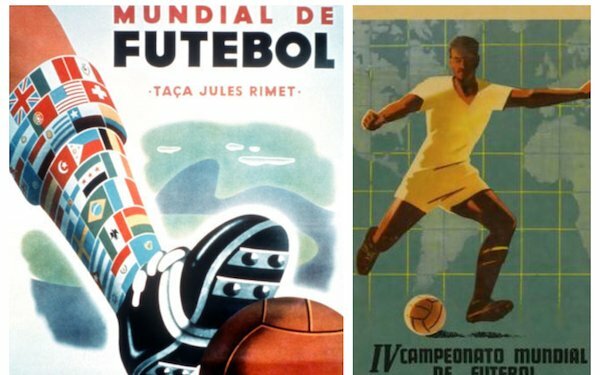 Instead of a knockout format, the 1950 World Cup consisted of round-robin group play that lead to a final game in which Brazil needed just a tie against Uruguay to lift the title. An estimated 200,000 people attended the game expecting to celebrate Brazil’s first World Cup title. After they sang the national anthem, the governor of Brazil said to the team, “Fifty million Brazilians await your victory.” Brazil scored two minutes after halftime, but gave up the equalizer from Juan Schiaffino 20 minutes later. With 11 minutes left, Alcides Ghiggia scored for a 2-1 Uruguay win. “Only three people have, with just one motion, silenced the Maracana: Frank Sinatra, Pope John Paul II and me,” said Ghiggia, the only surviving member of the Uruguay team until his death on July 16, 2015, 65 years to the day after the game. Moacyr Barbosa. The Brazilian was voted the best goalkeeper of the 1950 World Cup by journalists but was made the main scapegoat after the loss to Uruguay. He played only once more for Brazil and in 1993 when he wanted to visit the Brazi's pre-1994 World Cup training camp he was denied entry for fear of him creating bad luck. "The maximum punishment in Brazil is 30 years imprisonment, but I have been paying, for something I am not even responsible for, by now for 50 years," said Barbosa, who died in a poor man in 2000 at age 79. The loss against Uruguay led to the coining of a new word to describe a sudden catastrophe: Maracanazo.